Bailey: Ok, any pain here? Now, take a deep breath. Any dizziness when you stood up? Take a deep breath. Bailey: Ok. You are going home. You are gonna come back in 12 days for another round of IL2 and then you have your PET scan 2 weeks after that. But, there's no need for you to keep living in this bed. You should take it easy. You are still a cancer patient, but you're no longer a surgical patient. 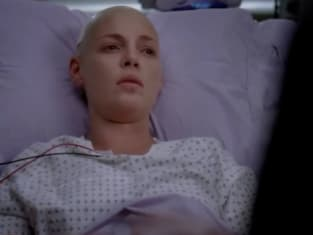 Izzie: Thank you Dr. Bailey. I don't know how to... thank you. Bailey: Ah, don't forget to sign the discharge papers before you leave.